17. Dorothy Hamilton- Educator extraordinaire, Hamilton founded Manhattan’s International Culinary Center, formerly known as the French Culinary Institute: It counts among its many alumni a triumvirate of iconoclasts dominant in 21st–century food world U.S.A.: David Chang, Dan Barber, and Wylie Dufresne. Hmmmm....Dorothy Hamilton. Where to begin? How's about with the fact that I hadn't heard of her before "the list" came out. Ugh. She's pretty world-famous. I'm in the culinary field. Why on earth did I not know of her? I mean, she's the founder of The French Culinary Institute which was opened in 1984 as a small, but well-respected French cooking school. Only now it is the International Culinary Center, a world-class educational facility and destination... which has launched over 15,000 culinary careers. Pretty Impressive. Aside from winning numerous awards, including ones from the James Beard Foundation, she is also the creator and host of a 26-part television series that aired on PBS called Chef's Story...as well as the author of the companion book. (She conceived textbooks for the culinary school, as well.) So, isn't it ironic how I couldn't find a single recipe by her to make today? Instead, I used a recipe devised for her by a grad of the ICC. Preheat the broiler. In a small saucepan, combine 1/2 cup of the sugar with the lemon juice, rosemary and 1/4 cup of the water and bring to a boil, stirring until the sugar dissolves. Let cool. In another small saucepan, combine the remaining 1/2 cup of sugar with 2 tablespoons of the water. Cook over high heat, stirring until the sugar dissolves. Cook without stirring until a deep amber caramel forms, about 5 minutes longer. Remove from heat and carefully add the remaining 2 tablespoons of water. Very carefully- it will spit and sputter a bit. When the steam subsides, stir the caramel over moderate heat just until the sugar that has seized up a bit from adding the water dissolves again and the caramel is smooth again. Thread the fruit on 16 skewers. 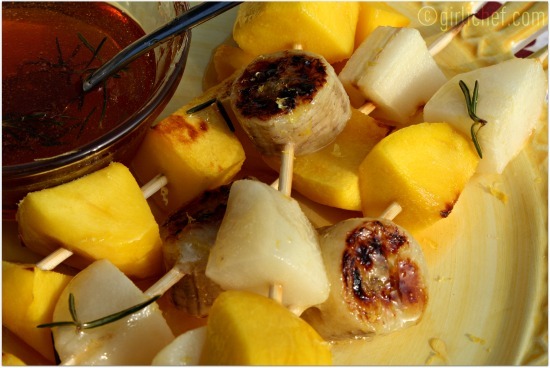 Set the skewers on a baking sheet and brush with the rosemary syrup; let stand for 10 minutes. Broil the skewers on 1 side only for about 3 minutes, until caramelized. 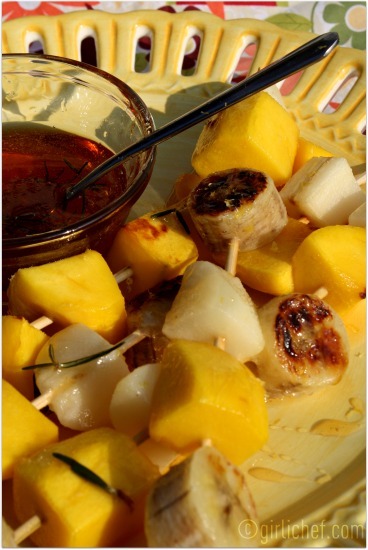 Transfer the skewers to a large plate, drizzle with the caramel sauce and serve. I looooved the flavor of the rosemary/lemon sugar syrup, so I stirred what was left of it after brushing onto the fruit, into the caramel. 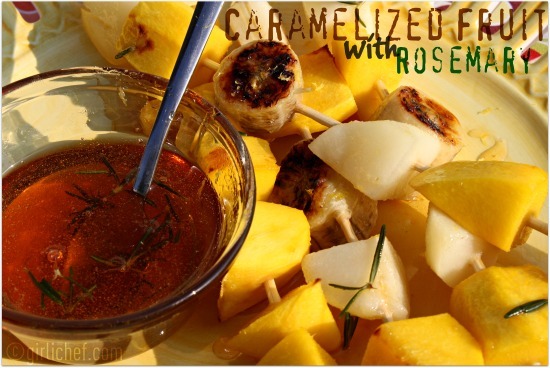 The rosemary syrup and caramel sauce can be kept at room temperature for up to 1 day. I recommend broiling these very close to the fire. Mine didn't get as caramelized as I would have liked in the little time it takes them to be "warm enough". Good...loved the caramel...but overall- meh. What a creative, quirky dessert. The colors in your photos are lovely, too. Don't feel like the lone ranger. I wasn't familiar with her either until this series. Makes me wonder where I've been. As much as I adore rosemary, I confess I've never used it in a dessert. Now that gives me some food for thought. Overall "meh"? hehe! I hate it when that happens, but it does sound delicious and the pictures are gorgeous. Sounds like a pretty healthy take on dessert ... a bit of sugar, some good fruit, and a fast fire. I think it's really interesting to work with rosemary and sugar in combination! Hmmmmm! This dessert looks wonderful! I've been doing more and more desserts flavored with rosemary and I'm sold. It's so refreshing. Well, it looks good to me! Amazing with the amount of things she did, it was so hard for us to find recipes. Your photos are great, you would never know it was just "meh"! Caramelized fruit sounds so yummy... And not as unhealthy as many desserts! I think I'll try this soon. Mango season is over in Miami but it will be a "must have" next season. Thanks! Ugh, this looks absolutely sinful... My mouth is watering! Can't wait to have a party so I can do these as the grand finale. I hadn't heard of her either and i was appalled! Seriously...where has she been all my life? You found a seriously delicious recipe to make. Had me at caramelized. It is interesting that so few recipes were found by Dorothy Hamilton - perhaps she is such a good cook that she doesn't use recipes? I also ended up making a recipe by a chef that put together recipes for her to make at home. I'm allergic to mangoes, but I can't wait to try this with something else. Maybe pineapple? Pastitsio + Stitches = PASTITCHIO!? book tour: Me Again by Keith Cronin + giveaway!